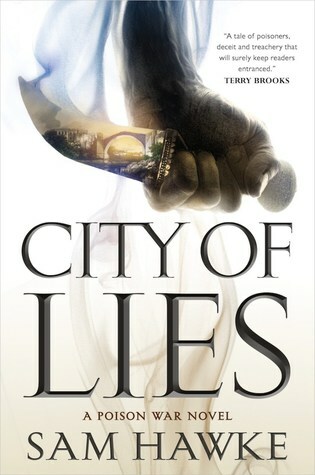 First off, I want to thank the publisher and author for an eARC of ‘City of Lies’ in exchange for an honest review. Receiving this eARC in no way influences my thoughts or opinions on the novel. With a hook like that, how is one not at least interested in learning more? On top of that, DAT COVER DOE. As you may probably well know, I am a sucker for beautiful book covers and this one caught my eye when it was revealed last year. I waited…and waited…and waited for eARCs to hit, and finally got the opportunity when my TBR was filled to overflowing. But the good news is: I have finally been able to finish it and can say it is one of my favorite reads of the year. Though it isn’t the typical hack n’ slash fantasy novel that I am used to, the gorgeous prose, intriguing story-line, and overall development of the characters make this an epic not to be missed. The first novel in the Poison Wars series takes on two (2) different POVs: brother and sister duo, Jovan and Kalina. Heirs to the “family business” of proofing, they sit in waiting for their opportunities to protect the Chancellor from poisons. When Kalina’s health ultimately prevents her from moving forward with the training, Jovan steps in at the behest of his uncle. Just so happens that Jovan is best friends with the Chancellor’s heir. But when both the Chancellor and Jovan’s uncle die from ingesting an undetectable poison, Jovan is thrown into duty and must protect the heir from any and all threats to his life. What he doesn’t expect is the city to come under seige, and for the heir’s life to be in immediate danger. Jovan and Kalina must do what it takes to uncover the mystery surrounding the deaths of the Chancellor and their uncle, while also keeping their hope for the future alive. But who can they really trust when it all comes down to it? I have to commend Hawke because, in my honest opinion, this did not feel like a debut whatsoever. Her writing feels like that of a seasoned veteran and she weaves a web of a story like none I’ve ever seen. Jovan and Kalina just jumped off of the pages and begged for my immediate attention from the get-go. The world-building is sensational, and the world that lives just on the underside of the streets of the city is slowly peeled back like the layers of onion just add to the overall reading experience. I also thoroughly enjoyed how balanced the POVs were between Jovan and Kalina, and how the author included a unique poison and description at the beginning of each chapter. I am a sucker for tidbits like these (all started with Michael R. Fletcher’s ‘Manifest Delusions’s series). Overall, I don’t care who you are, you need to give this book a shot. City of Lies is a novel chock-full of mystery, lies, deceit, loss, and triumph, and I cannot recommend it enough. I’m itching to read this too – going to have to clear a few more books off my plate before I can get to it (I’m so behind!) but sounds like I’m going to be in for quite a ride! Absolutely! I can understand about being behind 😅. Can’t wait to hear your thoughts!